When CSP & I met he had never been on a cruise. We actually met because of a cruise. I don’t know if I’ve told that story here yet. I searched my blog but too many posts came up when I searched “how I met CSP” so I got impatient. Anyway, CSP was invited to go on a cruise by my BIL who was then just my friend because BIL & my roommate had broken up after we’d all booked a cruise. But none of us save BIL knew CSP. By the time the cruise came around CSP & I were in lurve. Anyway, that cruise was super fun but ended terribly. Problems with customs held up debarkation for the entire ship. We weren’t allowed off the ship until 8 and a half hours after we were supposed to board our flight home. And we were in San Juan so that added an extra layer of difficulty. That experience turned CSP off cruising for a LONG time. He didn’t step aboard another ship until Lisa & Pete’s wedding cruise in November 2008. That one he loved. 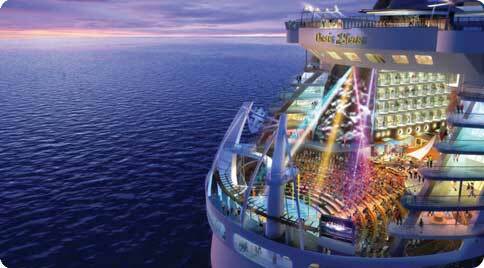 I recently told y’all about our cruise next year to celebrate CSP’s 40th bday and our 10th anniversary plus the Alaska cruise we’d like to take. All of these trips CSP has been keen on, but he’s never broached the subject of a cruise on his own. Until….. Recently he saw a commercial that combined his greatest love (other than me) and my greatest love (other than him): Starbucks at Sea. My boy LOVES Starbucks. He rarely goes more than a couple days without a stop at Starbucks. He knows that as long as he’s married to me I’m gonna be dragging him on cruises (where apparently the coffee does not measure up). But now he can get his Starbucks fix on the high seas! The Allure of the Seas has a Starbucks! It’s also the biggest ship in the world (for the moment). 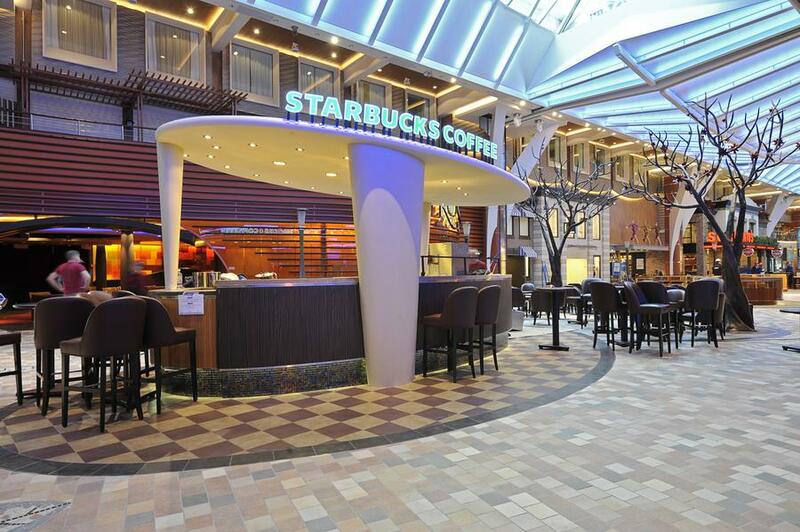 I found a picture of the Starbucks on the Allure of the Seas and it’s quite pretty! Alas, CSP will have to wait a while before sipping his cuppa on the deck of that ship. The new ships are always in the most demand and are usually more expensive. Plus we’ve got the 2012 and the Alaska trip to save our pennies toward. Ah well, a boy can dream.